Ohoidertawun beach is a gentle sloping beach. At the time of meti (low tide), this beach is instantaneously become a large field of up to 500 meters. Among all beaches on Kei Kecil Island, only Ohoidertawun has the longest meti every day. Usually, the meti time is the most awaited time for foreign tourists, for they can have time to sunbathing in the middle of the meti. We can also have fun at the meti by running and playing volleyball and football. Moreover, we can also looking for coral just like the Ohoidertawun villagers did. 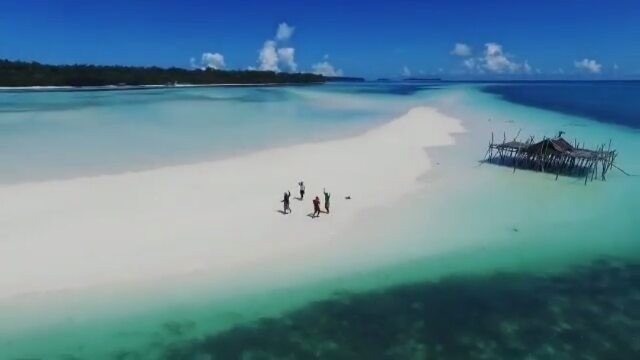 To go to the Ohoidertawun beach you can begin the journey from KotaTual, the Capital of Southeast Maluku, and the distance takes ± 30 minutes by renting a boat or SpeedBoat then precede by car. In this Ohoidertawun Beach is also provides some Homestay for visitors who want to linger and stay longer on this beach. Other uniqueness from this beach Homestay is specifically designed for the convenience of visitors. The homestay is made of bamboo and the roof is made from the Sago leaves, very traditional and comfort for visitors. Visiting this beach will become your great experience.